We fell in love with the Mitsubishi Outlander Sport the moment we laid eyes on it. This sporty SUV has that “I’m too cool for you” look on the outside. But like any well-rounded person, this car also had everything a driver and traveling family would want or need on the inside, too. And that’s why I think it deserves a look if you’re in the market for a new SUV. Interested? Well, let’s take a deeper look at this Mitsubishi SUV and how it powered us all the way through a recent trip to Asheville, North Carolina. This is a part of our series on Car Travel. Special thanks to Mitsubishi USA with providing us with the Outlander Sport for this trip. All thoughts and opinions are our own throughout this guide. If you’ve never visited Asheville, please do yourself a favor and go there. It’s full of fun things to do, with a thriving art and music scene, food for every type of traveler, and some of America’s best beer makers. 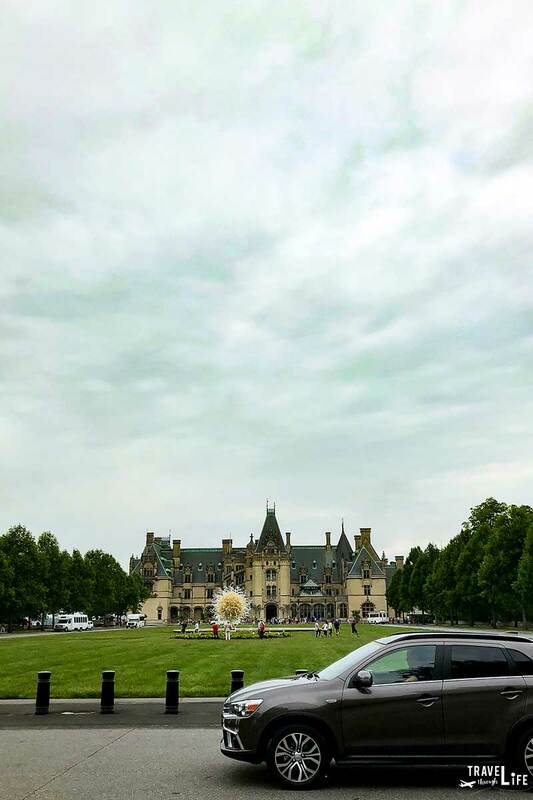 We love Asheville and were happy to take the Outlander Sport from Durham. 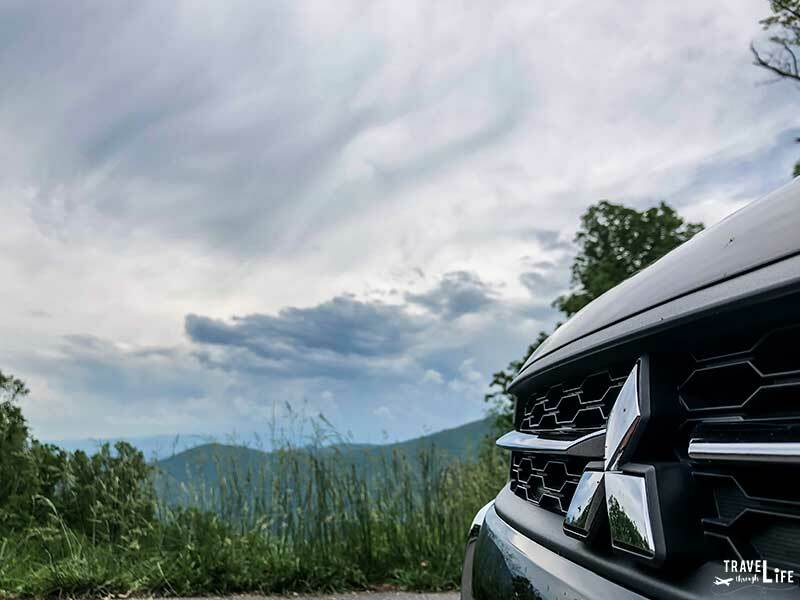 Traveling from the relatively flat Central Piedmont, where we live, to the mountains was a great test of this car, and let’s share 10 awesome things we discovered while driving it. Check out more of our Asheville travel guides. If you’re looking for somewhere to stay there, check out the best prices and availability on Asheville hotels, too! I love cars that start with the push of a button. As long as you have your keys, the Outlander Sport’s advanced FAST-Key Passive Entry system lets you in and get things started by pushing the start/stop button, as long as your foot is on the brake. When you arrive at your destination, just don’t forget to leave your keys in the car. You’ll need them to get back in! Our trip to Asheville meant that the mostly flat and straight roads turned into a series of curves and slopes. Without a single hiccup, the Outlander Sport’s 2.0L Engine smoothly cruised through each situation. I was impressed to see that even during moments when many other car engines might struggle, the ECO Indicator would flip on to show us that we’d even be getting maximum 30 MPG. Learn more about Outlander Sport Engine specs. The Outlander Sport was built with a huge emphasis on safety, so we’re going to break down each feature in a bit more detail. Every car review I see out there focuses on engine performance and handling, but what about the brakes, too? Many drivers in North Carolina think our interstates, highways, and even city streets are all one big racetrack. Because of that and because we were traveling with precious cargo, we needed to act quickly and not hurt ourselves in the process. The Outlander Sport features a whole system for that, including 11.6 ventilated front and 11.9 solid rear disc brakes, four-channel Electronic Brake-force Distribution with Brake Assist, Active Stability Control, and Traction Control Logic. The brakes work with the electronically controlled All-Wheel Control system (AWC). This is really cool to me, as the AWC keeps tabs on the road and, somehow, shifts resources to the wheels to guarantee the most traction possible. My mind is blown after thinking about this. We have crazy weather in North Carolina and if you’re driving to the mountains, you’re going to need this when you drive through the occasional snow or gravel backroad. The Lane Departure Warning system (LDW) came in handy when we were driving on the busy interstate to Asheville. How does it work? LDW uses an onboard camera to keep tabs on the car’s lane position. Amazing, right? Any time you leave your lane unintentionally, the alert goes off. Honestly, I think every car should have this because it would make more people use their turn signals when moving over! One day, when we were out driving, a bit of rain started coming down. I did nothing, but all of a sudden, the windshield wipers came on! Little did I know, the Outlander Sport’s automatic Rain-Sensing Windshield Wipers activate at the first sight of rain. Plus, they adjust to match the frequency of rainfall. That way, you don’t have to keep fidgeting with the wipers and can stay focused on the road ahead. When backing out of Biltmore’s busy parking lot or one of Asheville’s city streets, you need help. Thankfully, there’s a Wide-Angle Rearview Cam that immediately pops on when you shift in reverse. I love how the colors of the grid on the onboard screen help you align yourself and tell you just how far away you are from whatever is nearby! 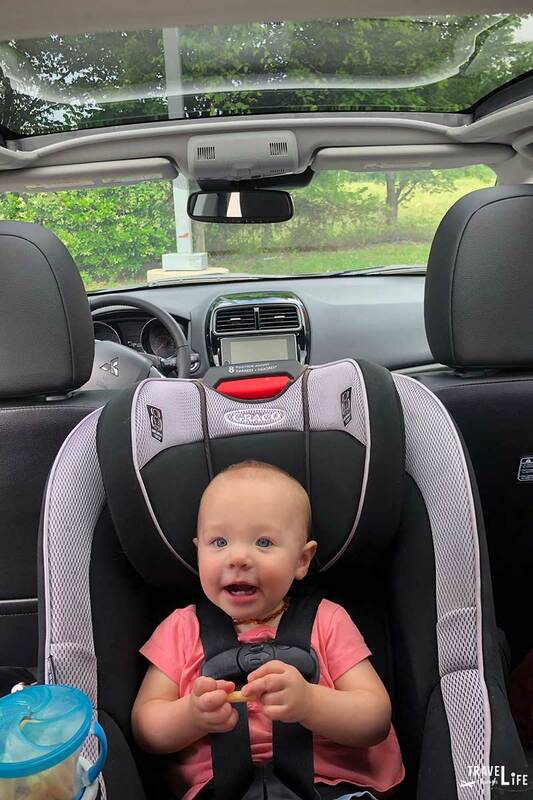 Traveling with a baby means you need more space and the Outlander Sport had plenty of it for our car seat, bags, and more. The heated front seats were a bonus for chilly mountain mornings. And when the weather warmed up, we set our desired temperature and the car automatically adjusted fan speed, air source, and temperature using its advanced climate system. Another cool thing about this car: it’s quiet on the inside. The Outlander Sport is built with keeping outside noises outside. I really felt relaxed while driving this car and was able to stay completely focused on driving it. We loved the 7” touchscreen display inside the Outlander Sport. 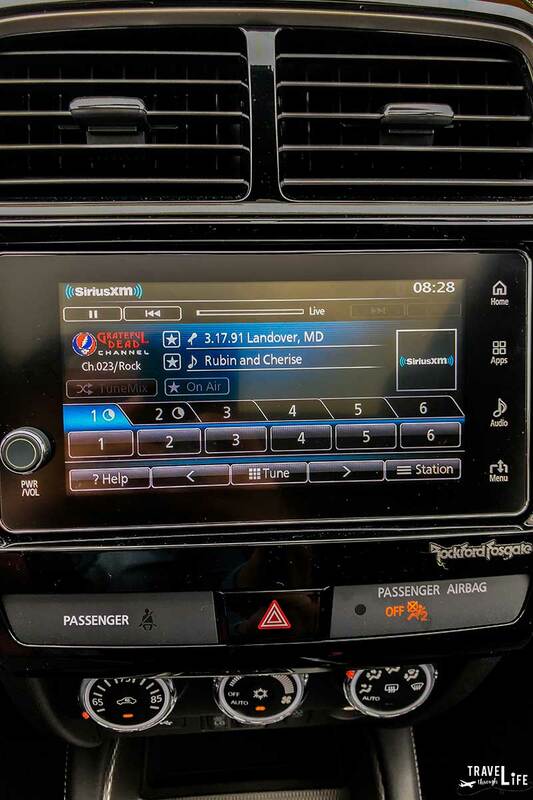 It gave us access to Sirius XM Radio, as well as our own phones’ music via Bluetooth, and easy access to answer phone calls from friends and family if necessary. It works with both Apple and Android phones, so everyone with a smartphone is welcome to wirelessly plug in. The panoramic glass roof is pretty cool, especially when you’re driving along the Blue Ridge Parkway. Seriously, it was hard to top this view when those mountains came into view. It was especially fun to look up when we drove through tunnels. At least that’s what Christina tells me! 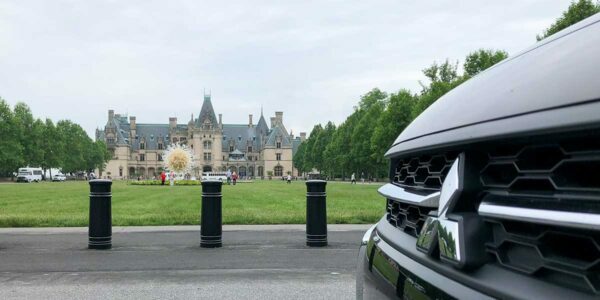 The Outlander Sport’s engine easily handled driving through Downtown Asheville. However, we were more interested in seeing how this car would handle I-40 from Durham. Also, for this car to pass our test, it had to make the Blue Ridge Parkway’s curves and inclines seem like child’s play. And the verdict? Knocked it all out of the park! We love this car and think you will, too. 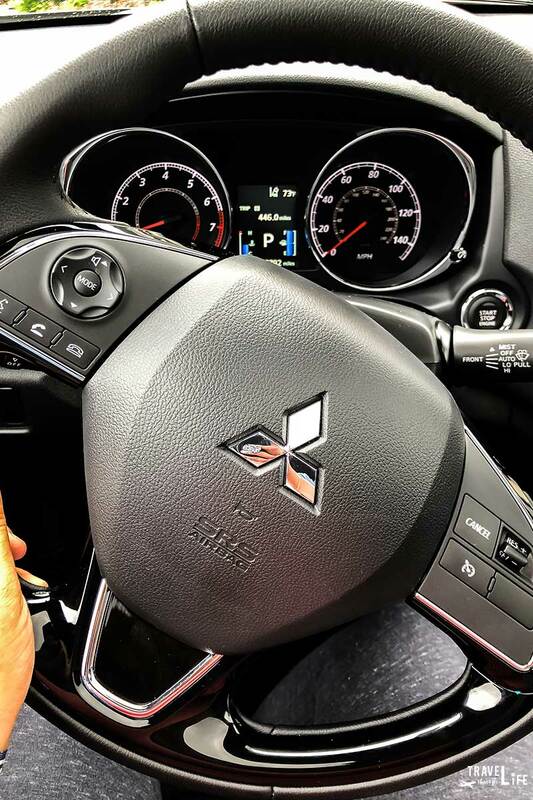 If you’re looking for a new SUV, go find a Mitsubishi dealer near you and test drive one of these beauties!